Together with Next Step Test Prep, Dr. Ryan Gray has authored the second book in the Premed Playbook series. The Guide to the MCAT is everything that you need to understand what the MCAT is, how to prepare for it, what test day looks like, and so much more. If you have questions about registering, voiding, studying, etc, this is the book for you! What this is not: This book is not a content review book. This book only answers some of the most common questions to help ensure that you're making the most informed decisions when it comes to the MCAT. Why the MCAT is so important and how you should prepare for it. How the MCAT affects your ability to get into medical school. The best MCAT resources and choosing the right ones for you. Last minute MCAT tips to help you maximize your score on test day. 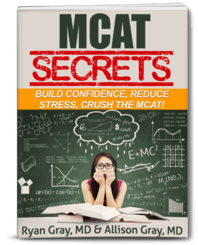 "This book was very helpful in understanding the ins and outs of the MCAT. It gives a lot more insight and advice than quick Google searches. It is definitely a must-read for pre-med students (both trad and non-trad)! If you're looking for other helpful pre-med books, Dr. Gray's other book in the series (The Premed Playbook Guide to the Medical School Interview) is also definitely worth checking out." Dr. Gray started the Medical School Headquarters because he believes that every student who wants to be a physician has a chance of becoming one. Dr. Ryan Gray is a former United States Air Force Flight Surgeon who found a passion for helping premed students on their journey to medical school. Best known for his podcasts, which have been downloaded over 3,000,000 times, Dr. Gray has interviewed numerous admissions committee members and deans of admissions for medical schools. Through The Premed Years podcast and the Medical School Headquarters sites, Dr. Gray has helped thousands of students gain the confidence they need to successfully navigate the premed path. Dr. Gray lives outside of Boulder, CO, with his wife Allison, who is a neurologist, and their daughter Hannah.